Located right in the heart of Tyler, Texas, we provide up-to-the minute weather conditions, forecasts, and radar images. We also display a view of the weather in the Piney Woods of East Texas via our live webcam. Please let us know you stopped by and leave your comments about the site by clicking here. Have you found this website useful? I hope you'll consider supporting it with your donation. Please recommend TylerTexasWeather.Com to your friends! If you would like to receive daily weather forecasts from Tyler Texas Weather, please complete the form below. Forecasts with current weather conditions are sent four (4) times a day at 6:30AM, 10:30AM, 2:30PM, and 6:30PM. 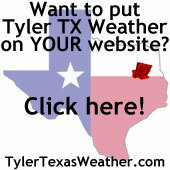 Please whitelist the email address of webmaster@tylertexasweather.com so that the forecasts don't go to spam. If you haven't begun receiving forecasts with 24 hours, please send an email to webmaster@tylertexasweather.com so I can help resolve any issues. Thank you for subscribing to Tyler Texas Weather Forecast emails. Thanks for taking the time to submit your feedback. Copyright © 2019 TylerTexasWeather.Com - All rights reserved.TylerTexasWeather.com is privately owned and operated, and is not affiliated with the City of Tyler, Texas, or any business or governmental entity.This data is provided as a hobby from a personal weather station, and while regularly verified for accuracy, you should not base important decisions regarding life or property on information from this website or on any weather information obtained from the Internet. For any questions or comments regarding this website, contact the Webmaster at TylerTexasWeather.Com.